Yes, once upon a time, long before ESPN, there were just four bowl games. They were the Cotton Bowl, the Sugar Bowl, the Rose Bowl (inexplicably called the “Granddaddy of them all”), and the Orange Bowl. They were all played back to back to back to back on New Year’s Day on national television. Every year, they featured the eight best teams in the country. You couldn’t get to these bowls without having a nearly perfect season. But now we have forty bowls. By my UT math, that means that 80 college football teams get to play in a bowl game. And the bowls aren’t just played on New Year’s Day. They start shortly after Thanksgiving and continue to nearly Groundhog’s Day. You don’t even have to be a good football team to get a bowl bid. In fact you don’t even have to be mediocre. You can have a losing record and go to a bowl game this year, as four of the 80 teams have accomplished, if you want to call losing seven out of twelve games an accomplishment. Yesterday, the University of Memphis Tigers played Auburn University in something called the “Birmingham Bowl.” Next year they will probably be invited to the Tupelo Bowl, or perhaps the Fountain City Bowl. Tomorrow the University of Tennessee Vols will play Northwestern in the Outhouse Bowl. Other bowl games this year include the GoDaddy.com Bowl (I have no idea what in the heck this means), the Foster Farms Bowl, the Poinsettia Bowl, the Dandelion Bowl, the Pinstripe Bowl, the Cactus Bowl, the Prickly Pear Bowl, the Famous Idaho Potato Bowl, the Anonymous Rhode Island Rutabaga Bowl, and something called the “Tax Slayer Bowl,” which sounds like it’s sponsored by some right-wing extremist group. And then of course there is college football’s equivalent of the “Final Four” beginning this afternoon featuring Alabama and three other teams they can easily beat. 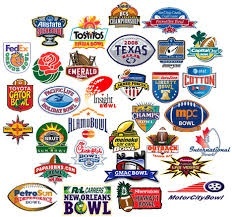 Well, I love college football, but I’m not exactly bowled over by forty bowl games, some of which feature teams that couldn’t win a middle school championship. And so since I am quickly becoming a football old curmudgeon, I have no intention of watching every bowl game that appears on the TV screen in my den this weekend. I’m only going to watch the major bowl games—the Cotton, Sugar, Granddaddy Rose, Orange … and, of course, the Outhouse. GO VOLS! rush my essay: Wow, I myself am a football fan. Good seeing that you are becoming a football old curmudgeon. I agree this is how all it becomes, none of us have the intention but we are curious and passionate that we get to be the curmudgeon. Nick McCall: Bill, just two words: Seersucker Bowl. If anyone could make that happen, it's YOU! You, of all people, have the tools and the technology to make it so. Happy New Year, and GO VOLS!